Erodium is a genus of the botanical family Geraniaceae. The genus includes about 60 species, for the most part originating in the Mediterranean or western Asian regions. American species are known as filarees or heron's bill, Eurasian ones are usually called stork's bill. Carl Linnaeus grouped in the same genus Geranium the three similar genera Erodium, Geranium, and Pelargonium. 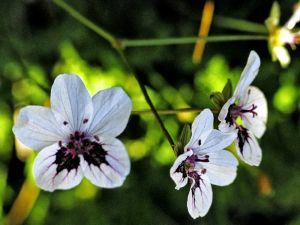 The distinction between them was made by Charles Louis L'Héritier de Brutelle based on the number of stamens or anthers: five for Erodium, seven for Pelargonium, and ten for Geranium. However, the three genera have the same characteristics in regard to their fruit, which resemble long bird beaks. That characteristic is the basis for the names: Geranium evokes the crane (Greek geranos), Pelargonium the stork (pelargos) and Erodium the heron (erodios). Formerly Erodium glandulosum, loaded with charm, this long-blooming plant forms a low tuft or mound of ferny olive-green leaves. Orchid-like flowers appear from late spring until autumn, in a very soft lavender shade with deep violet-black spots or eyes. Erodium macradenum is one of the hardiest Heron's bill species, asking only for the excellent drainage provided by a rock garden, gravel scree or alpine trough or ground cover. Divide clumps every 2 to 3 years in spring. Foliage is quite fragrant. Received a Royal Horticultural Society Award of Garden Merit (1993). One of the hardiest species, asking only for the excellent drainage provided by a rock garden, gravel scree or alpine trough, but can be grown anywhere in a sunny well drained situation. Uses: For rock garden, gravel scree or alpine trough, raised beds or lovely just grown in pots.